What happens in Milwaukee, stays in Milwaukee! Members of the NNPDF’s Board of Directors braved blizzards and other inclement weather to travel to Milwaukee for the foundation’s 2011 Annual Meeting February 4 – 6. The weekend was jam-packed with meetings of the board and committees, making the most of the opportunity to meet face-to-face. Results of the work of 2010 were discussed and evaluated, and plans were laid for a very busy year ahead. Though lots of business was conducted over the course of the three days, a few recent birthdays were celebrated over dinner. 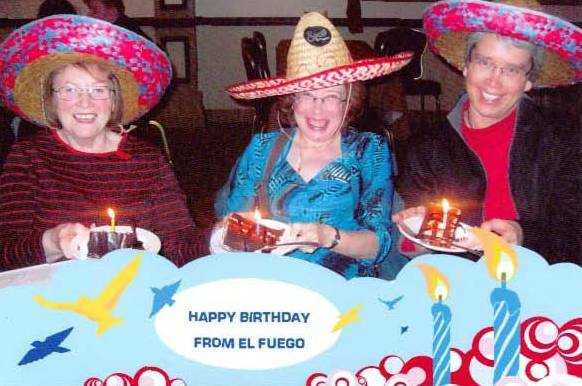 Susan Green, Sandra Cowie and Karen Quandt were honored with sombreros and slices of cake. Feliz cumpleanos! For more information about the National Niemann-Pick Disease Foundation (NNPDF), visit www.nnpdf.org.